Herat (; Persian: هرات‎‎, Herât; Pashto: هرات‎; Ancient Greek: Ἀλεξάνδρεια ἡ ἐν Ἀρίοις, Alexándreia hē en Aríois; Latin: Alexandria Ariorum) is the third-largest city of Afghanistan. It has a population of about 436,300, and serves as the capital of Herat Province, situated in the fertile valley of the Hari River. It is linked with Kandahar and Mazar-e-Sharif via Highway 1 or the ring road. It is further linked to the city of Mashhad in neighboring Iran through the border town of Islam Qala. Herat dates back to the Avestan times and was traditionally known for its wine. 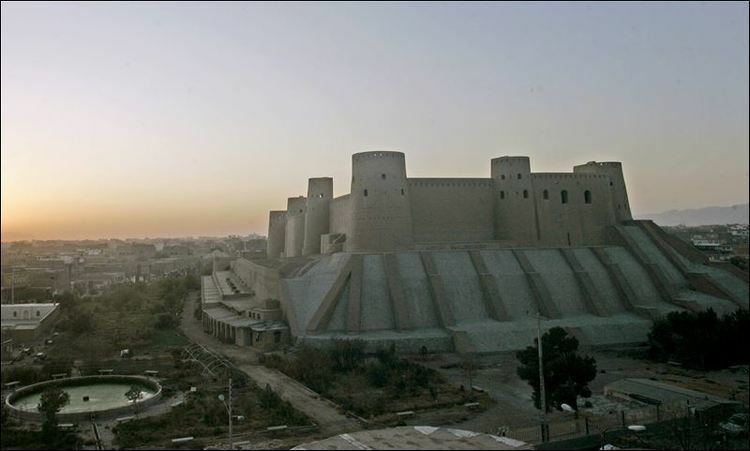 The city has a number of historic sites, including the Herat Citadel and the Musallah Complex. During the Middle Ages Herat became one of the important cities of Khorasan, as it was known as the Pearl of Khorasan. It has been governed by various Afghan rulers since the early 18th century. In 1717, the city was invaded by the Hotaki forces until they were expelled by the Afsharids in 1729. After Nader Shah's death and Ahmad Shah Durrani's rise to power in 1747, Herat became part of Afghanistan. It witnessed some political disturbances and military invasions during the early half of the 19th century but the 1857 Treaty of Paris ended hostilities of the Anglo-Persian War. Herat suffered from extensive destruction during the Soviet war in the 1980s, but certain parts of the city have been spared from it. Herat lies on the ancient trade routes of the Middle East, Central and South Asia. The roads from Herat to Iran, Turkmenistan, and other parts of Afghanistan are still strategically important. As the gateway to Iran, it collects high amount of customs revenue for Afghanistan. The city has an international airport. Herat is a regional hub in western Afghanistan in close proximity to Iran and Turkmenistan. The city has high residential density clustered around the core of the city. However, vacant plots account for a higher percentage of the city (21%) than residential land use (18%) and agricultural is the largest percentage of total land use (36%). "Herāt was the name of one of the chiefs among the followers of the hero Narīmān, and it was he who first founded the city. After it had fallen to ruin Alexander the Great rebuilt it, and the circuit of its walls was 9000 paces." Herodotus described Herat as the bread-basket of Central Asia. At the time of Alexander the Great in 330 BC, Aria was obviously an important district. It was administered by a satrap called Satibarzanes, who was one of the three main Persian officials in the East of the Empire, together with the satrap Bessus of Bactria and Barsaentes of Arachosia. In late 330 BC, Alexander captured the Arian capital that was called Artacoana. The town was rebuilt and the citadel was constructed. Afghanistan became part of the Seleucid Empire after Alexander died, which formed an alliance with the Indian Maurya Empire. Roman Historian Strabo writes that the Seleucids later gave the area south of the Hindu Kush to the Mauryas after a treaty was made. However, most sources suggest that Herat was predominantly Zoroastrian. It became part of the Parthian Empire in 167 BC. In the Sasanian period (226-652), Harēv is listed in an inscription on the Ka'ba-i Zartosht at Naqsh-e Rustam; and Hariy is mentioned in the Pahlavi catalogue of the provincial capitals of the empire. In around 430, the town is also listed as having a Christian community, with a Nestorian bishop. "...Arab armies carrying the banner of Islam came out of the west to defeat the Sasanians in 642 AD and then they marched with confidence to the east. On the western periphery of the Afghan area the princes of Herat and Seistan gave way to rule by Arab governors but in the east, in the mountains, cities submitted only to rise in revolt and the hastily converted returned to their old beliefs once the armies passed. The harshness and avariciousness of Arab rule produced such unrest, however, that once the waning power of the Caliphate became apparent, native rulers once again established themselves independent. Among these the Saffarids of Seistan shone briefly in the Afghan area. The fanatic founder of this dynasty, the coppersmith’s apprentice Yaqub ibn Layth Saffari, came forth from his capital at Zaranj in 870 AD and marched through Bost, Kandahar, Ghazni, Kabul, Bamiyan, Balkh and Herat, conquering in the name of Islam." Herat was a great trading centre strategically located on trade routes from Mediterranean Sea to India or to China. The city was noted for its textiles during the Abbasid Caliphate, according to many references by geographers. Herāt also had many learned sons such as Ansārī. The city is described by Estakhri and Ibn Hawqal in the 10th century as a prosperous town surrounded by strong walls with plenty of water sources, extensive suburbs, an inner citadel, a congregational mosque, and four gates, each gate opening to a thriving market place. The government building was outside the city at a distance of about a mile in a place called Khorāsānābād. A church was still visible in the countryside northeast of the town on the road to Balkh, and farther away on a hilltop stood a flourishing fire temple, called Sereshk, or Arshak according to Mustawfi. "If any one ask thee which is the pleasantest of cities, Thou mayest answer him aright that it is Herāt. For the world is like the sea, and the province of Khurāsān like a pearl-oyster therein, The city of Herāt being as the pearl in the middle of the oyster." Timur took Herat in 1380 and he brought the Kartid dynasty to an end a few years later. The city reached its greatest glory under the Timurid princes, especially Sultan Husayn Bayqara who ruled Herat from 1469 until May 4, 1506. His chief minister, the poet and author in Persian and Turkish, Mir Ali-Shir Nava'i was a great builder and patron of the arts. Under the Timurids, Herat assumed the role of the main capital of an empire that extended in the West as far as central Persia. As the capital of the Timurid empire, it boasted many fine religious buildings and was famous for its sumptuous court life and musical performance and its tradition of miniature paintings. On the whole, the period was one of relative stability, prosperity, and development of economy and cultural activities. It began with the nomination of Shahrokh, the youngest son of Timur, as governor of Herat in 1397. The reign of Shahrokh in Herat was marked by intense royal patronage, building activities, and promotion of manufacturing and trade, especially through the restoration and enlargement of the Herat’s bāzār. The present Musallah Complex, and many buildings such as the madrasa of Goharshad, Ali Shir mahāl, many gardens, and others, date from this time. The village of Gazar Gah, over two km northeast of Herat, contained a shrine which was enlarged and embellished under the Timurids. The tomb of the poet and mystic Khwājah Abdullāh Ansārī (d. 1088), was first rebuilt by Shahrokh about 1425, and other famous men were buried in the shrine area. Herat was shortly captured by Kara Koyunlu between 1458-1459. 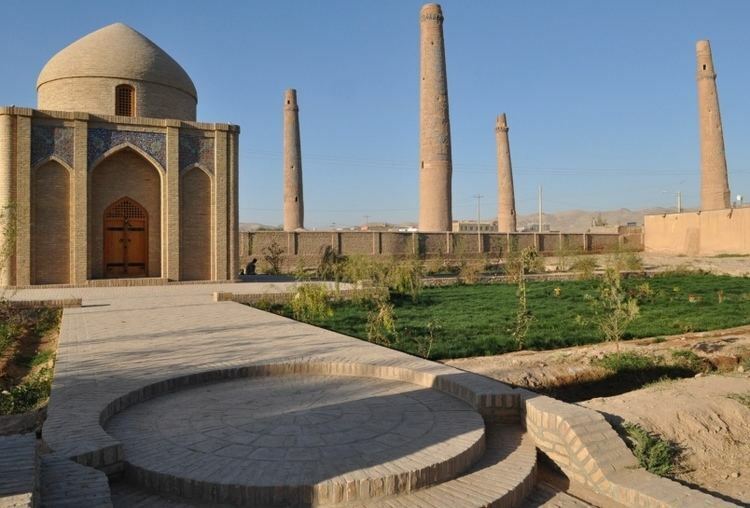 In 1507 Herat was occupied by the Uzbeks but after much fighting the city was taken by Shah Isma'il, the founder of the Safavid dynasty, in 1510 and the Shamlu Qizilbash assumed the governorship of the area. Under the Safavids, Herat was again relegated to the position of a provincial capital, albeit one of a particular importance. At the death of Shah Isma'il the Uzbeks again took Herat and held it until Shah Tahmasp retook it in 1528. The Persian king, Abbas was born in Herat, and in Safavid texts, Herat is referred to as a'zam-i bilād-i īrān, meaning "the greatest of the cities of Iran". In the 16th century, all future Safavid rulers, from Tahamsp I to Abbas I, were governors of Herat in their youth. In the 1960s, engineers from the United States built Herat Airport, which was used by the Soviet forces during the Democratic Republic of Afghanistan in the 1980s. Even before the Soviet invasion at the end of 1979, there was a substantial presence of Soviet advisors in the city with their families. Between March 10 and March 20, 1979, Afghan army in Herāt under the control of Ismail Khan mutinied. Thousands of protesters took to the streets against the Communist regime's oppression led by Khalqi Nur Mohammad Taraki. The new rebels led by Khan managed to oust the communists and take control of the city for 3 days, with some protesters murdering any Soviet advisers. Reprisals by the government followed, and between 3,000 and 24,000 people (according to different sources) were killed, in what is called the 1979 Herat uprising, or in Persian as the Qiam-e Herat. The city itself was recaptured with tanks and airborne forces, but at the cost of thousands of civilians killed. This massacre was the first of its kind since the country's independence in 1919, and was the bloodiest event preceding the Soviet invasion in December 1979. Herat suffered some destruction during the war in the 1980s. The province as a whole was one of the worst-hit. In April 1983, a series of Soviet bombings damaged half of the city and killed around 3,000 civilians, described as "extremely heavy, brutal and prolonged". Ismail Khan became the leading mujahideen commander in Herāt. After the departure of the Soviets, he became governor of Herat Province. In September 1995, the city was captured by the Taliban without much resistance, forcing Ismail Khan to flee. However, after the U.S. invasion of Afghanistan, on November 12, 2001, it was captured from the Taliban by forces loyal to the Northern Alliance and Ismail Khan returned to power (see Battle of Herat). In 2004, Mirwais Sadiq, Aviation Minister of Afghanistan and the son of Ismail Khan, was ambushed and killed in Herāt by a local rival group. More than 200 people were arrested under suspicion of involvement. Herat has a cold semi-arid climate (Köppen climate classification BSk). Precipitation is very low, and mostly falls in winter. Although Herāt is approximately 240 m (790 ft) lower than Kandahar, the summer climate is more temperate, and the climate throughout the year is far from disagreeable, although winter temperatures are comparably lower. From May to September, the wind blows from the northwest with great force. The population of Herat numbers approximately 436,300 as of 2013. It is a multi-ethnic society with Persian-speakers as the majority. There is no current data on the precise ethnic make-over but according to a 2003 map found in the National Geographic Magazine, the percentage figure of ethnic groups was given as follows: 85% Tajik, 10% Pashtuns, 2% Hazaras, 2% Uzbeks and 1% Turkmens. Persian serves as the lingua franca of the city. It is the native language of Herat and the local dialect - known by natives as Herātī - belongs to the Khorāsānī cluster within Persian. It is akin to the Persian dialects of eastern Iran, notably those of Mashhad and Khorasan Province. The second language that is understood by many is Pashto, which is the native language of the Pashtuns. Religiously, Sunni Islam is practiced by the majority while Shias make up the minority. Herat International Airport was built by engineers from the United States in the 1960s and was used by the Soviet Armed Forces during the Soviet war in Afghanistan in the 1980s. It was bombed in late 2001 during Operation Enduring Freedom but has been rebuilt in the last decade and renamed Herat International Airport. The runway of the airport has been extended and upgraded and as of August 2014 there were regularly scheduled direct flights to Delhi, Dubai, Mashad, and various airports in Afghanistan. At least five airlines operated regularly scheduled direct flights to Kabul. In 2007, Afghanistan and neighboring Iran finalized an agreement for the establishment of a rail service between the two countries. Construction of the 191 km (119 mi) railway, from Khaf in Iran to Herāt, is in progress on the Iranian side of the border. There are plans to finish a rail line between Khaf, Iran and Herat which has been funded by Iran and the Asian Development Bank and construction is underway. There is also the prospect of an extension across Afghanistan to Sher Khan Bandar. Jewish cemetery - there once existed an ancient Jewish community in the city. Its remnants are a cemetery and a ruined shrine.